I finally found why I could write this note without being very depressed that I was leaving pure paradise….my anecdote? Write it 3-5 days BEFORE leaving and have a glass of wine. Thank you , thank you, thank you for sharing your home! It is truly a gift. We absolutely love your home, your setting, your gardens, your tropical breezes and wonderful energy your home has. It “was/is” an amazing vacation. My husband turned 50 and we could not have picked a better place on earth to celebrate his birthday. We treasured the peace, serenity and sun and each other. It is and incredible escape and so needed. Thanks for everything! We wish you well and we will return! A fabulous week in a wonderful house! We have been to Anguilla a lot of times but his was especial! Grand kids had a great time in the pool. We find this house great for a family. Also love the grounds- such beautiful flowers and view. Rosemary was very helpful and kind. Kitchen was well equipped for cooking. I am sure we will be back to villa Gardenia!! 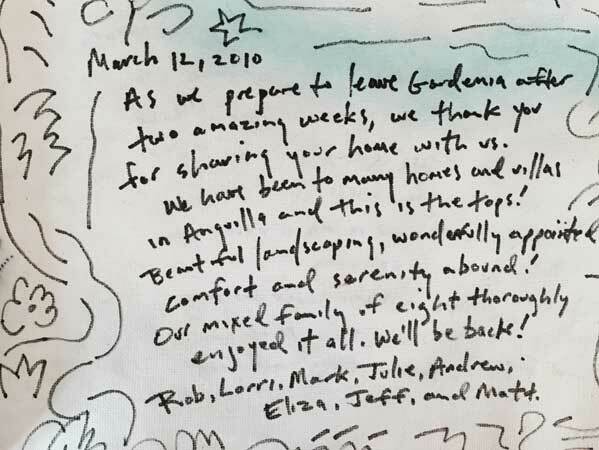 As we prepare to leave Villa Gardenia after two amazing weeks, we thank you for sharing your home with us. We have been to many homes and villas in Anguilla and this is the tops! Beautiful landscaping, wonderfully appointed comfort and serenity abound! Our mixed family of eight thoroughly enjoyed it all. We will be back! 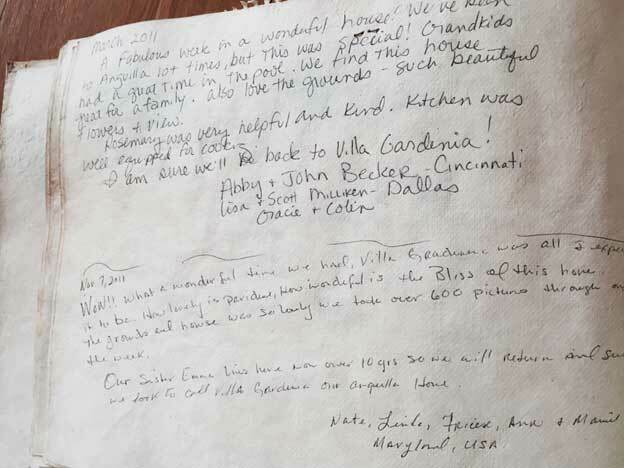 We loved our stay at the Villa Gardenia. The view is exceptional and we were lucky enough to see a couple of whales. The villa is well suited for two families. The three teen age girls enjoyed having the mother in law suite to themselves. We will miss the spectacular weather, the relaxing mornings by the pool, snorkeling and swimming at the beaches, and the crisp blue water. We hope to come again. 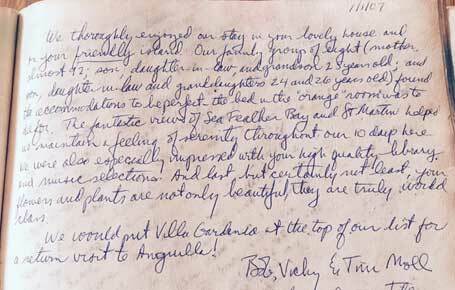 Let us add our thanks for our stay at you spectacular villa. Villa Gardenia is absolutely gorgeous and so comfortable. The 7 of us had room to spread out yet to come together on the beautiful patio for some great meals, or just reading by the pool. The beaches are incredible. Some of our favorites were………………. We are leaving more relaxed than we h ave been in years!! We thoroughly enjoyed our stay in your lovely house and on your friendly island. Our family group of eight – mother almost 92; son; daughter in law, and grandson 2 years old- found the accommodations to be perfect. The bed in the orange room was to die for. The fantastic views of Sea Feather Bay and St Martin helped us maintain a feeling of serenity throughout our 10 days here. We were also especially impressed with your high quality library and music selections. And last but not least your flowers and plants are not only beautiful they are truly world class.